The statement issued Wednesday evening by Egypt’s Defense Minister Abdel Fattah al-Sisi confirmed the expectations of the last few days: the army, backed by the masses, had carried out a coup. Yes, tens of millions had taken to the streets in recent days, illustrating just how badly the majority of the population wanted to see president Mohammed Morsi and the Muslim Brotherhood out of office. But Morsi was installed just a year ago, having been democratically elected. And he was overthrown by the military. Several major figures in Egypt’s political system sat next to al-Sisi when he delivered his statement — among them former International Atomic Energy Agency head (and would-be president) Mohamed ElBaradei, Coptic Pope Tawadros II, and Al-Azhar University President Sheikh Ahmed el-Tayeb. But to the left of al-Sisi, slightly behind him, sat a young, bespectacled, long-haired man to whom the defense minister owes the takeover. This man, Mahmoud al-Aziz, was the representative of Tamarod (the revolution) a group that began operating only two months ago. Tamarod succeeded where opposition politicians had long failed and led protests unprecedented in size that eventually resulted in Morsi’s ouster. 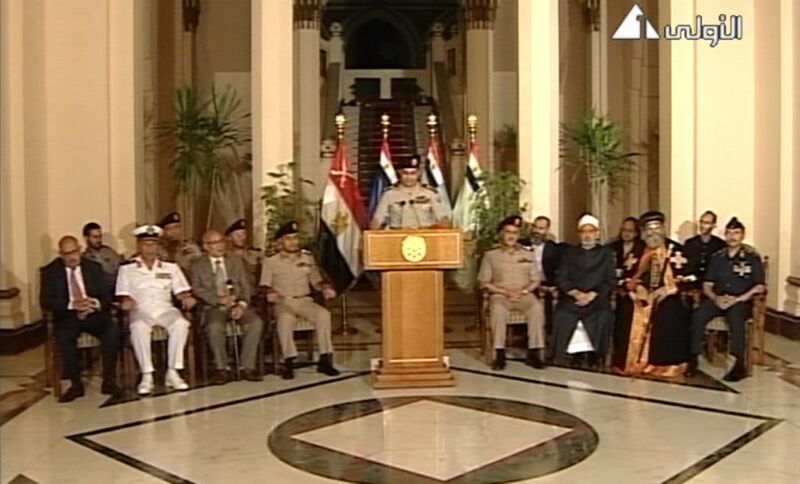 For al-Sisi, it was the speech of a lifetime. He started off by explaining that the military’s High Command had tried several times, to no avail, to reason with the presidency to accept the “people’s” terms. And therefore, he explained, it had been decided to present the “road map” to get Egypt out of its crisis. The Egyptian general, who has yet to turn 60 and was appointed by Morsi to the job just 11 months ago, has been transformed into Egypt’s strongman. He is the one who appointed Supreme Constitutional Court chairman Adli Mansour as interim president. And he is also the one who will dictate the spirit of the new constitution and set the date for new elections. Mansour is expected to be sworn in and take on presidential authorities, alongside al-Sisi and the army, on Thursday. Meanwhile, the army has isolated Morsi and banned senior Muslim Brotherhood officials from leaving the country. Wednesday evening also saw the closure of some of the television networks associated with the Muslim Brotherhood. It appears that al-Sisi, like a good military man, does not dally but, rather, charges with full force in order to eliminate the enemy. Yet the enemy, as far as al-Sisi and much of Egypt are concerned, is impossible to eliminate. At best it can be temporarily reduced in scale. In order to ensure the defense minister’s move is a success, he needs the cooperation of the Muslim Brotherhood, or at least some of the Islamists. For now the ball is in “al-Ahwan’s” (the Brotherhood’s) court. If it consents to Morsi’s ouster, it may even win the next presidential elections with a more effective candidate. If it refuses and orders its followers to battle the new regime, Egypt may spiral into a bloody cycle of violence. Morsi, minutes before he was removed by the army to a secure place, was able to smuggle out his reaction speech, in which he made clear that he refused to accept the military’s takeover. “I will not accept this attempt to take us backwards,” he said. Morsi called on the army to resume its traditional role of protecting the people. “I am the elected president of Egypt,” the Islamist politician said. “It is now demanded of the people to defend this legitimacy and … for legitimacy to be constitutional,” he added, saying that he was willing to call for new elections, but only for the parliament. It was too little, too late. Five people were quickly reported killed Wednesday evening in clashes between supporters and opponents of the Muslim Brotherhood, and they are not likely to be the last casualties. Morsi’s ouster and the success of the secular protest in its clash with the Muslim Brotherhood in Egypt may presage the fall from power of other Islamist movements in the region, like Tunisia and Gaza. In Tunisia, a protest against the Islamist constitution has already gotten underway. But for Hamas, the news out of Cairo Wednesday night was especially grim. The Palestinian organization is losing its most substantial ally, one that gave it vital political support. The Muslim Brotherhood, Hamas’s parent organization and in many ways its “Godfather,” lost its power to a military establishment that is hostile to the Palestinian group’s goals. Hamas, which has clashed with Syria and Iran over the course of the last year, now finds itself nearly isolated in the Arab sphere. Perhaps the new reality in which it finds itself will lead the weakened Hamas to conclude its reunification with Fatah. Time will tell. As of Wednesday night, all eyes were focused on Egypt, where the short-lived presidency of Mohammed Morsi underlined, in case anyone was still in doubt, that the holding of one round of free elections does not constitute a transition to democracy.